Wedding is an ethnic weaving of families and of two souls with their individual fates and destinies. It is the most important event in one's life and hence every bride and groom has the right to look their best. The Bridal and Jewelry Fashion Show organized by “Mirror” and held on 4th December 2005, was an attempt to showcase the latest trends in wedding wear this season. 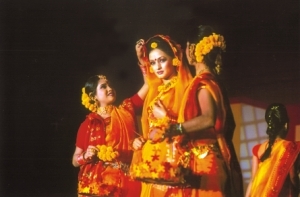 It also brought the three days' “Bridal Festival and Jewelry Exhibition with Expo 2005”, held in Bangladesh China Friendship Centre, to a grand conclusion. The fashion show was compeered by Azra and Russell. Zahangir Alam, editor of Mirror gave a short inaugural speech. The chief guest of the occasion was Md. Barkat Ullah Bulu, Honorable Advisor, Ministry of Commerce, who in his speech very rightly said that these kinds of events encourage businessmen to showcase their products and services and also to seek out foreign markets. For example, Bangladeshi jewelry has great potential for export and such shows and exhibitions promote indigenous products in a market that is besotted with imported goods. The inaugural speeches were followed by a dance sequence. After the dance sequence there was an award giving ceremony in different categories. 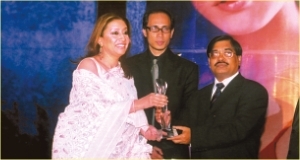 The renowned makeover artist Farzana Shakil won the award in the category of the “Best Makeup Artist”. “Apan Jewelers” was awarded as the “Best Jewelry Company” while “Dressydale” was the best fashion house. The bestselling stall was “Ahong” while “Ikebana” won the award for the best floral arrangement. In the fashion show the models displayed bridal wear and grooms wear which included saris with head veils, lehengas and sherwanis. The trend was towards bright colors and surprisingly apart from the traditional red, pink and orange, blue was also an important color. Some other unusual colors that were seen are off white, yellow and contrasts such as orange and pink and blue with orange. The emphasis was on sequin work on chiffon and georgette saris. The jewelry was either gold with stones or matt gold and they belonged to “Apan Jewellers”. “Ahong”, “Bilash”, “Shopper's World “, “Nabila”, “DressyDale” and “Noboni Collections” were among the participants of the fashion show. “Ahong” was the first fasion house to display their wedding wear. Their saris were bright and red, pink and blue were the dominant hues. The saris were decorated with sequin work on georgettes and chiffons. The sherwanis and Punjabis had stonework and some of them were teamed up with stoles, which have been the rage for the past few years. One interesting thing that “Bilash” did is that they made the male models wear saris and the veil was wrapped around their heads as “pagris”. This caused a lot of surprise among the audience. “Nabila” had an interesting range of grooms wear and the sherwanis were simply lovely. The main colors of the sherwanis and punjabis were grey, white, black, red, beige and pastel colors. Some of the sherwanis had a coati while others were teamed with stoles. ”Nabila”'s saris were also quite eye catching and had some interesting contrasting colors such as orange and green and off-white with multicolored embroidery and sequins. “Dressydale”, before displaying their wedding wear, showed a small documentary on what goes on backstage……that is how each dress or a sari is the craftsmanship of many workers. 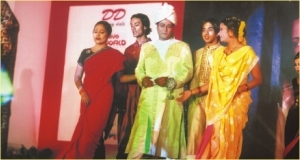 Dressydale's choreography was quite creative and they made the models dance to popular Bangla folk songs. They had some interesting yellow saris which are suitable for “Gaye Halud”. 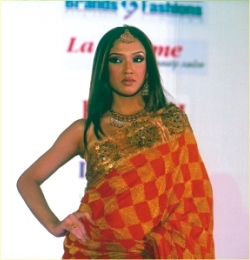 “Noboni Collections” had an interesting array of silk saris. “Shoppers' World” also had an exquisite collection of saris and lehengas for the bride. The makeup of the models was done by “Woman's World”, “La Femme” & “Elegance” and they did a very good job. Though the fashion show captured the audience's imagination, there was a lot of room for improvement in choreography. However, on the whole the fashion show was an excellent effort on the part of the organizers and the participants and it certainly set the trend in wedding fashion for the forthcoming season. It will also encourage people to choose Bangladeshi products while trousseau shopping.